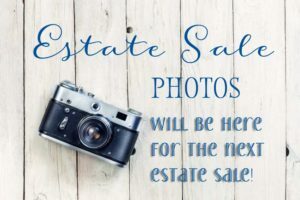 Check back often to find out when and where our next North Texas estate sale will take place or get notified by email by adding your name to our email list. You can unsubscribe at anytime. Valuable items are removed from the home until the day of the sale. Here’s a very small sampling of what’s in this sale. Please view the photos. Not all items have been photographed. There’s just too much to show you everything! There’s lots more, so come take a look. Cash, debit and credit cards (over $50) accepted. Please leave the kids at home (NO CHILDREN ALLOWED, NO STROLLERS), leave the purses & bags in your vehicles, but bring big, strong guys to help with removing large purchases! We regret we are not able to respond to questions regarding the sale, the items in the sale, or the prices. We are frequently running short of time, or already involved in the set up of another sale. And we just cannot always remember the prices and details of so many items! If you’d like to sign up for Lorrie’s estate sale notification emails, you can do so below. You can unsubscribe at any time. Feel free to forward the email to anyone you think would be interested in the upcoming estate sale.